With the workshops of the CM3 program, joimax® offers a broad range of courses. Participants will develop deep endoscopic knowledge by means of expert lectures on anatomy, indications and contraindications, surgical techniques and instrumentation, combined with intense practical training on dedicated simulators and anatomical specimens. Special experiences, pitfalls, limitations and the individual management of complications along with anesthetic strategies and postoperative care are also discussed. Participating in our workshops will allow to officially reach level of experience 1 to 4. For Endoscopic Spinal Surgery Level 1-2 workshops will provide the participants with the widest possible basis. Especially for beginners, the unique transforaminal access to the spinal canal and the spatial orientation of the view through the endoscope can be challenging. Level 3-4 workshops are designed to deepen existing knowledge and expand further surgical techniques, e. g. cervical treatment options, as well as endoscopic fusion techniques, and are in particular suitable for the already experienced surgeons. Pain Therapy workshops address facet and sacroiliac joint treatment, peripheral nerve treatment and interventional nucleus therapy. Our courses take place regularly in different countries worldwide. Intracs® em – The smart navigation system is based on electromagnetic tracking. Navigating the sensor tip makes it particularly suitable for an easy access to any spinal target. We are inviting to our User Meetings on a regular base. Please come back soon, we will announce the next meeting as soon as possible. Please note: Workshops in China are held in Mandarin. Please register at your local dirstributor for this course. You can sign up for ths course soon. The course is suitable for spinal surgeons with experience in endoscopic surgical procedures. 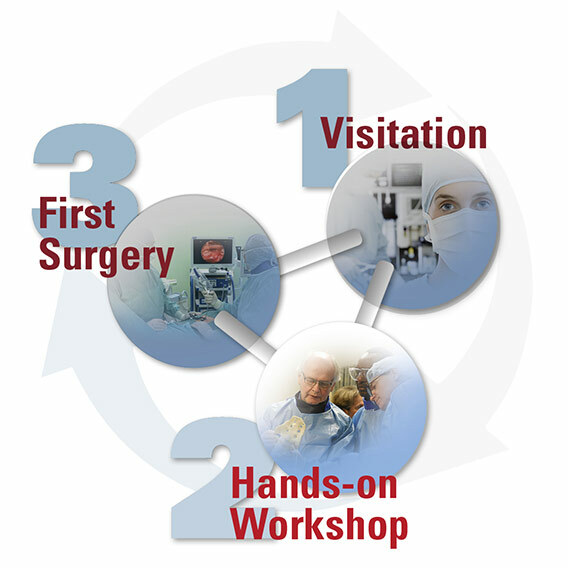 User meetings shall allow individual deepening of knowledge and experience achieved during former joimax® workshops or own surgical cases. Level of training is defined individually and appropriately. Premise: Successful completion of a joimax® Workshop. All required documents (application form, CV, and accommodation form) must be sent one month prior to the course. The course fee of US$ must be paid two weeks before the course. The course fee will be refundable at 50% in case of cancellation 7 days before the date of the course. The fee will not be refundable (US$0) if cancellation is less than 7 days before the date of the course. Only bank transfer is acceptable. Please see below for bank information. It will be held in Operation Theater. It will be announced on the final program. Due to doctor’s OP schedule or private matter, time & location of lecture and hands-on-workshop may be changed. Keep a silence and behave appropriately while you are in the Operating Room. Observation and Question can be allowed under surgeon’s permission. Please be on time for daily schedule such as Morning Conference, Lecture, and Workshop. In case of leaving the operation theatre for any reason, please notify the course coordinator. Physicians from different disciplines experienced in spinal therapy, interested to learn the latest endoscopic minimally invasive surgery techniques for the complete spinal column. Please understand that course participants must meet preliminary criteria. International workshops are held in English. For specific groups courses can be held in the participants‘ mother tongue. The fee includes workshop materials, refreshments and the evening event (2 day course). The course fee includes course materials, joimax® scrubs and the personal X-ray-protection package consisting of a custom joimax® gown (monogrammed optional) , thyroid shield, X-ray glasses. Ordering details as sizing and monogramming will be taken care of at the workshop. Korean International MISS Course has own pricing. Advance payment must be made in full prior to the course date. An invoice will be sent upon receipt of the registration form. We would be pleased to give you some hotel recommendations. You will benefit from special joimax® rates. These rates are available until 4 weeks prior to the event. CME credits will be requested for all workshops. Points are announced in the course agenda. If you need any further information please contact us. Registrations for the joimax® Training Program need to be in writing with this application form or online (www.joimax.com). The decision on a potential participation is done on order of receipt. No claim can be asserted by the applicant. The registration will be confirmed by separate mail and/or with the written invoice at the latest and represents a mutually binding obligation. The invoice is to be paid 2 weeks after receipt at the latest. No cancellation fee applies if cancelled at least one month before the workshop. If cancelling within 2-4 weeks prior to the course, a 50 % fee is charged. If cancellation occurs less than two weeks prior to the workshop, the full workshop registration fee is charged. Please note that cancellations must be submitted in writing. All workshops contain theoretical lectures and intense practical training. Access planning and training of surgical techniques as well as handling the instruments and endoscopic orientation are trained on anatomical specimen, supported by preparative training on sawbones and simulators. The workstations are equipped with C-arms, joimax® endoscopy towers and surgical instrumentation. X-ray protection is provided. There are 2 up to 5 workstations per course with 4-5 participants per station. We are currently finalizing new training facilities in our joimax® headquarter in Karlsruhe, Germany! Especially our workshops on Pain Therapy will be conducted here. We will publish dates for 2019 for these workshops soon! US Cadaver and Korean International MISS Course has own pricing.